Jeep Cherokee, Grand Cherokee, Renegade, Commander, Compass, Patriot, Wrangler, Liberty, Wrangler Unlimited Sahara. Used cars, used vans, used SUVs, used sports cars, used luxury cars, Jeep used SUVs. 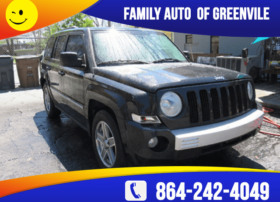 Family Auto of Greenville, buy here pay here, bad credit no credit, used cars near me 29617, used cars Greenville, used cars Greenville, used cars Easley, used cars Travelers Rest, quick approval.